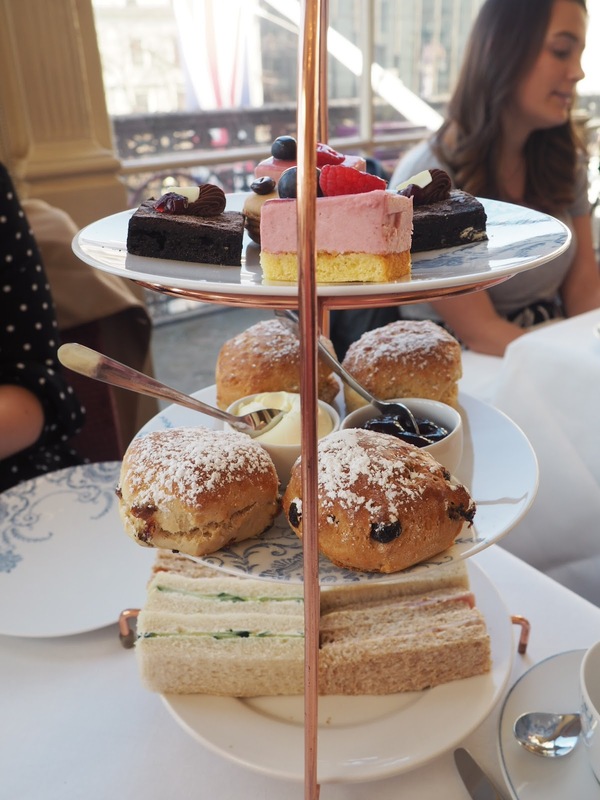 Anyone who knows me knows I love a good afternoon tea and, if there's a glass or two of alcohol included in there then it's even more of a winner for me. 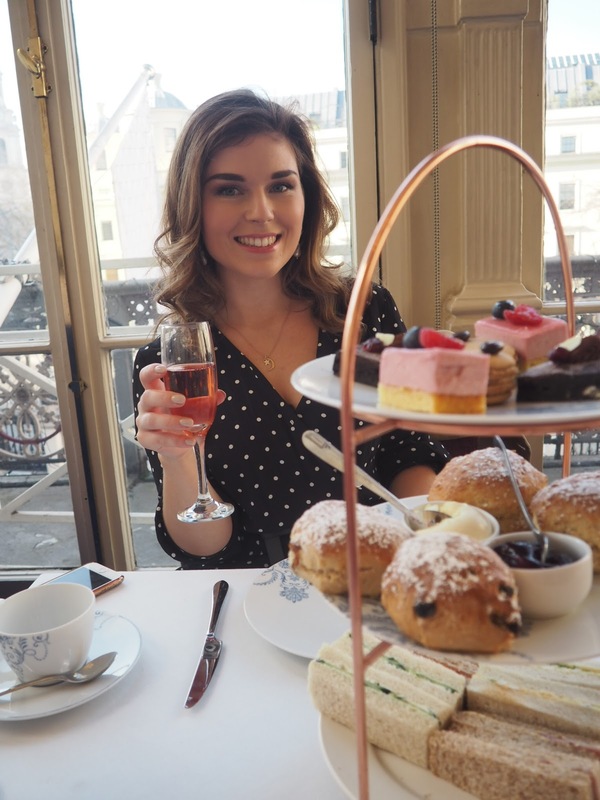 My friend Larissa who you probably all recognise as she's been on here before and I wanted to have a good catch up over some good food so, naturally, we decided on afternoon tea! It was the first time I'd seen Larissa since Christmas and, as she's currently planning her wedding, we definitely had a lot to catch up on. 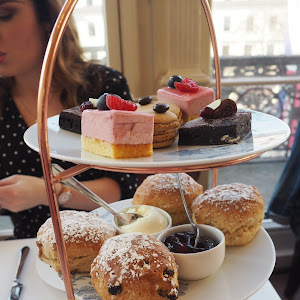 When it comes to finding a good afternoon tea (especially in London) I would always look out for reviews or blog posts to see what people really thought of the food...and the tea, of course! 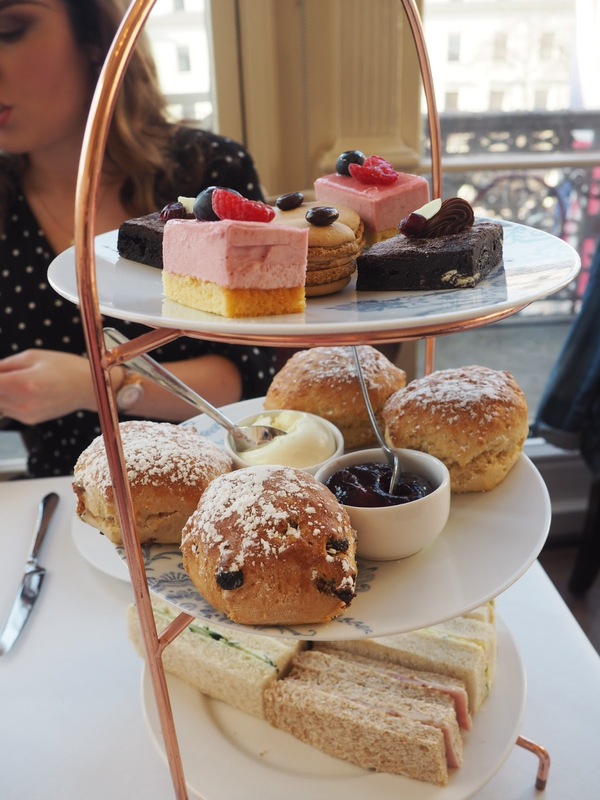 But, as I'd been to Amba Hotel twice before for this afternoon tea I knew it would be a good'un. The hotel is just a good location if you're spending the weekend playing tourist in the City as it's literally a hop, skip and a jump away from Charing Cross station and right next to Trafalgar Square. You can't get more London than that, can you! 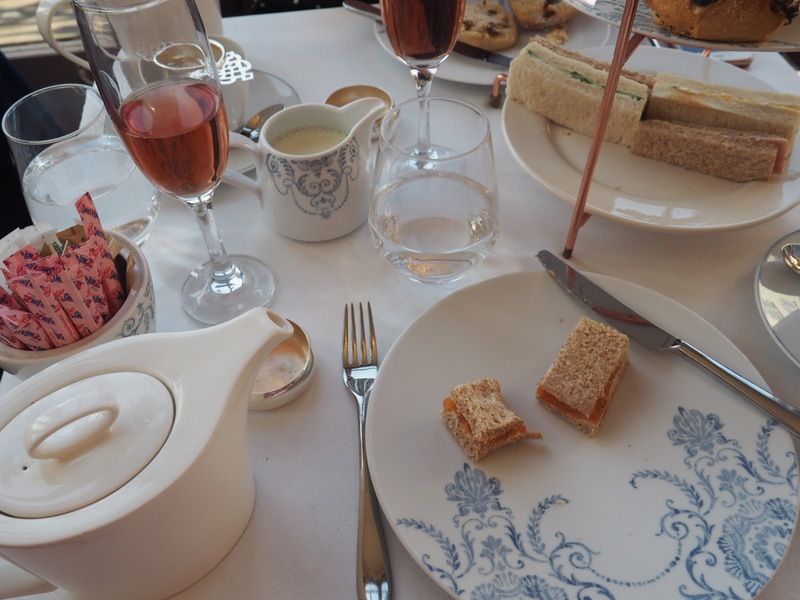 The staff helped us find where we had to go (yes, I've been twice before but the hotel's so huge it's easy to forget) and we settled down in our comfy seats in the Terrace Room getting very excited for our food and tea. 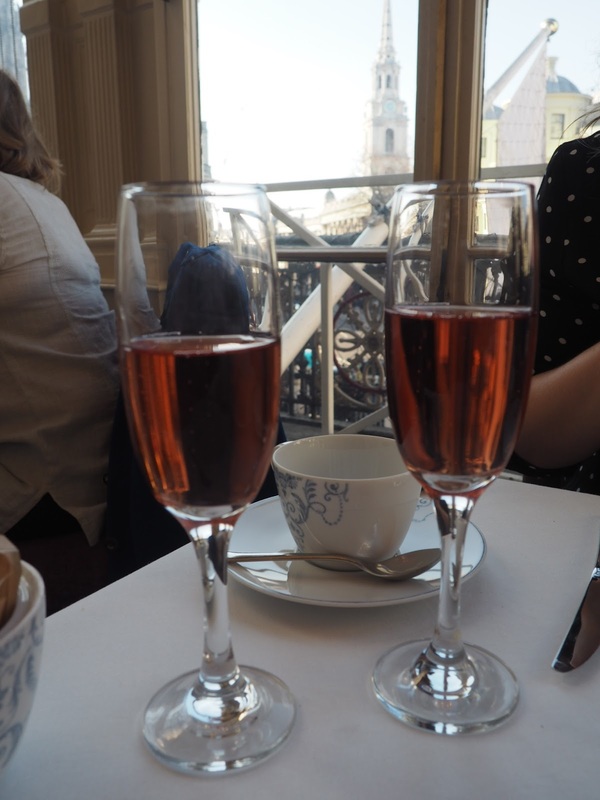 But first, we got to have our glass of Taittinger Champagne and the chance to peruse the extensive tea list. From the more traditional Earl Grey to the not-so-traditional Persian pomegranate, there's definitely a tea there for everyone! The sandwiches were just as good as I remember them from last time, the bread was spongy and soft and you get a lot of filling in each one. 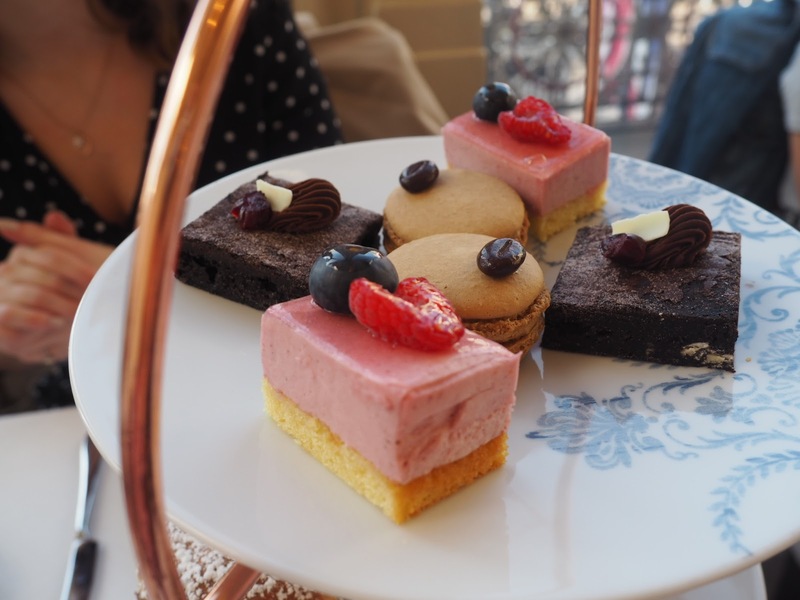 There's also a good amount for two people, you get one of each as standard but, if you don't fancy one or you have allergies then you can just let the staff know and they'll readjust the menu for you. Being unfussy eaters, Larissa and I tried the lot. 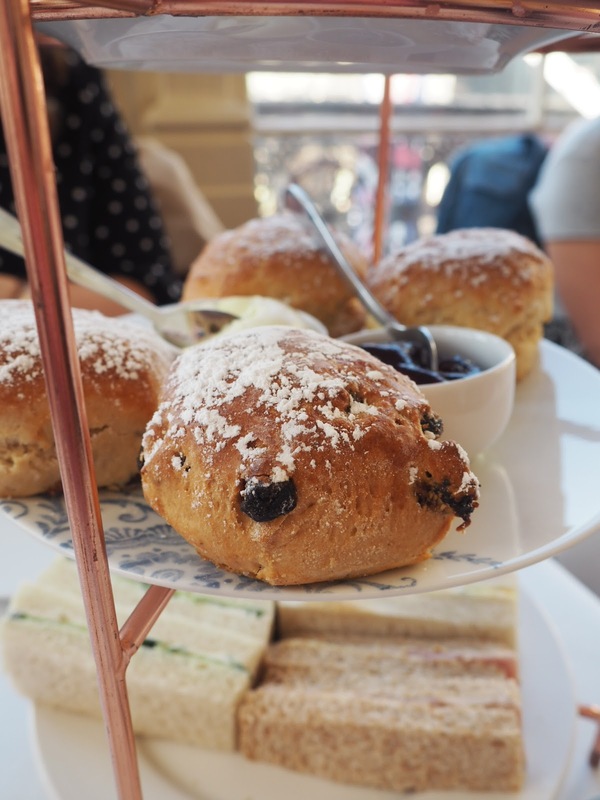 I think this actually might be my favourite part in an afternoon tea, the scones were warm and we got a good amount of jam and cream. 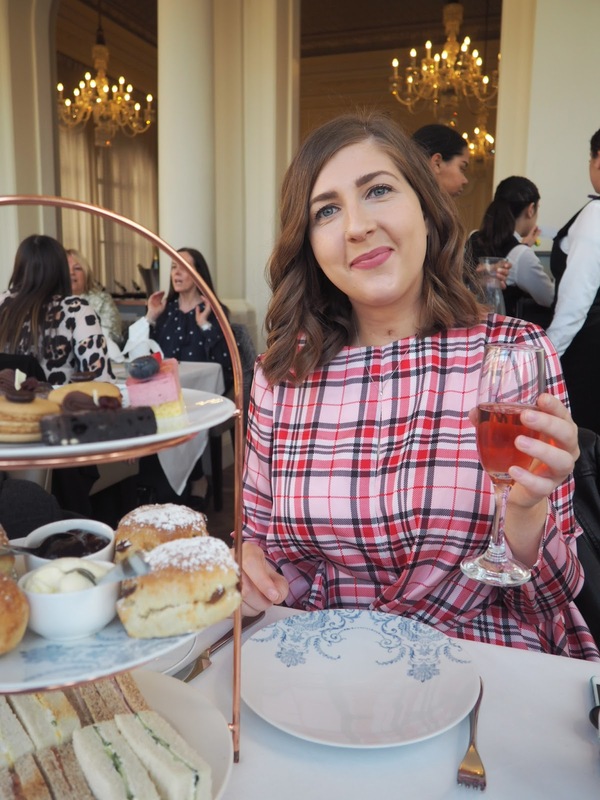 We had one plain and one fruit scone each but I couldn't finish mine (let's just say the wedding diet didn't put Larissa off finishing both), the cream was fresh and the jam had delicious chunks of strawberry - my fave! And to finish, some teeny tiny cakes! The only one we didn't have was the coffee macaroon as neither of us are particularly keen on coffee but the rest of them were delish! The brownie, in particular was rich and chocolate-y but the hit of cranberries inside add a little extra flavour. Yum! As you may have already guessed, I would highly recommend Amba Hotel for afternoon tea. I got a voucher from Wowcher (where I work) for mine so it was only £22 each - a real bargain for the amount you get and the quality of food and tea on offer. Shop the Wowcher deal here or if you fancy trying a Gin one then head here. The last London home-y post I did was way back in October last year and was when my room here was still an awful beige/ old cream colour and just needed a little bit of care. Since then I have painted it (because waiting for the landlord to do it was just getting ridiculous) in a crisp white gloss and matte and reorganised and rearranged my belongings. What I haven’t spoken about on here before is how exactly I store all my clothes (shoes, bags and coats included) in such a *relatively* small space. I mean, before I really go into this post, I just wanted to say I have been rather lucky with the size of both rooms I’ve rented in London. I’ve rented this one since October 2016 and still have enough room for everything to fit comfortably in it without it looking messy and cluttered…even with my sporadic spending habits! Now, most furnished house shares come with a bed, wardrobe and chest of drawers as standard, which is great! But, this also means YOU haven’t chosen the colour and design of these furnishings, someone else has, so you have to make do with whatever you’ve been given even if it’s not to your taste. Now I’ve painted my room white I actually like the chestnut brown furniture that it came with and the fact that my wardrobe and chest of drawers match is just a bit of a win. 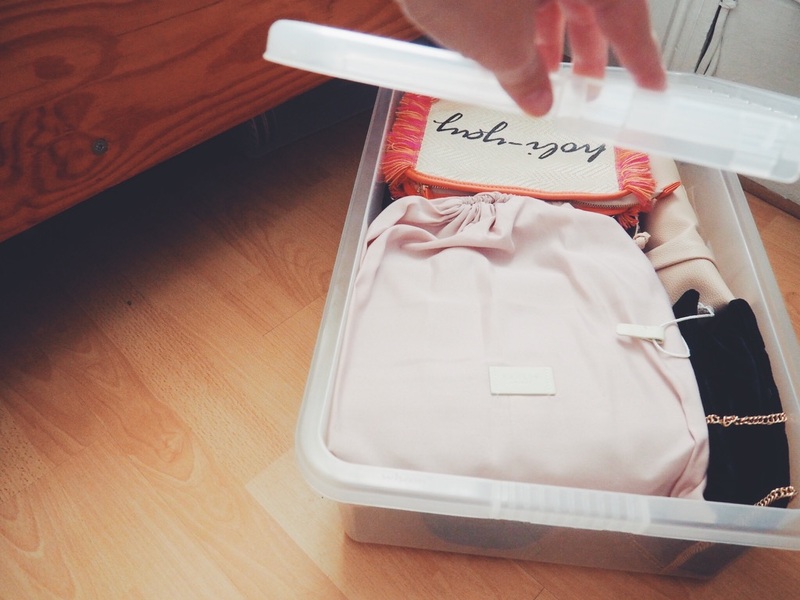 The wardrobe is where I tend to keep the bulk of my clothing and the things I regularly wear. Having said this I do alternate what I keep in wardrobe and what I keep on my rail (more about that later) as the season changes. 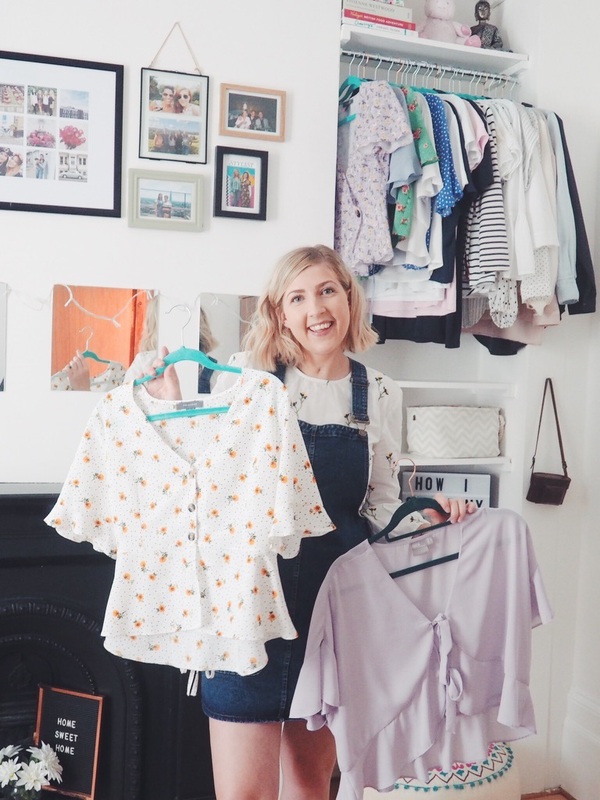 As we’re being hit with a heatwave at the moment I’ve stored my cardigans and jumpers away in the wardrobe (and some in my under bed storage) rather than my tops which I have stored on my rail. 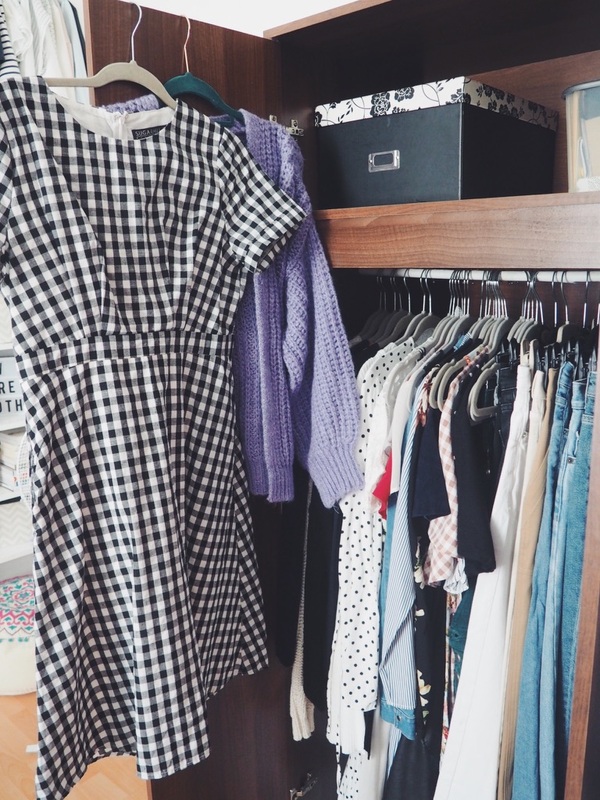 As well as knitwear, I keep my dresses and jeans in here simply because it’s the tallest hanging space in my room and they’re the longest items of clothing that I own. As you can see, I organise my clothing rather meticulously. 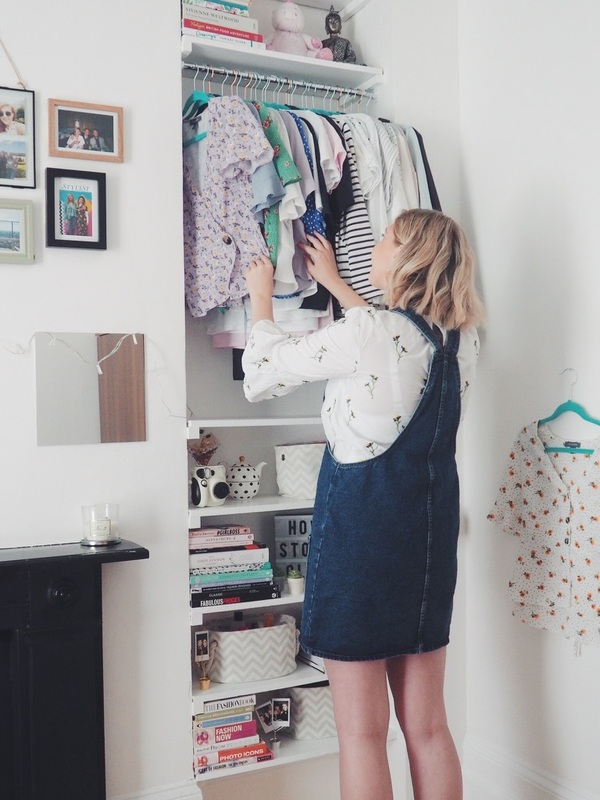 It goes from cardigans to jumpers, from midi length dresses, to dressy dresses to long sleeved dresses to short sleeved dresses to pinafores and the jeans are in colour order. Some call it OCD, I call it ‘easy to grab what you need when you’re in a rush’. Like I said before I keep some more of my jumpers in my under bed storage as there’s really no need for the super thick one’s I have at the moment. 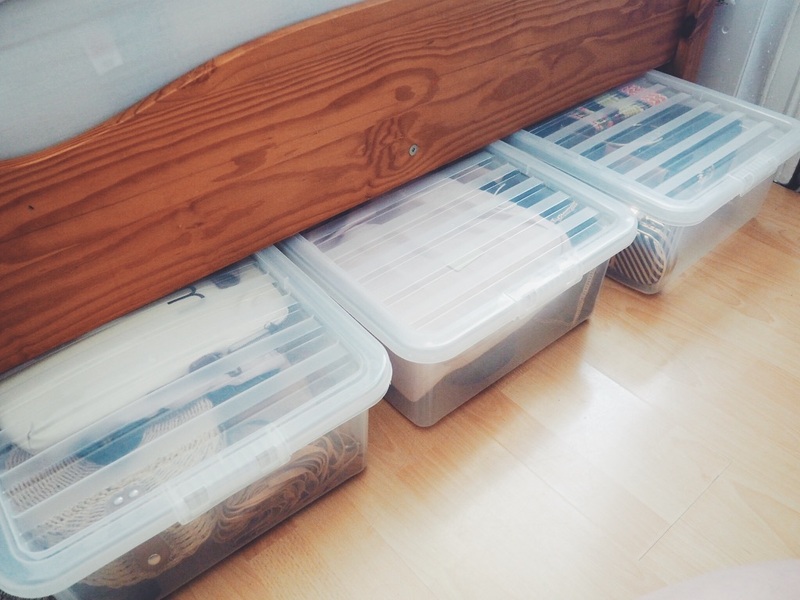 As well as this, under my bed I have five other boxes – towels and bed sheets in one, winter shoes in one, bags in three (yes, I love my bags). If you are in a house share and are limited in storage space then I would highly recommend getting these sorts of boxes. 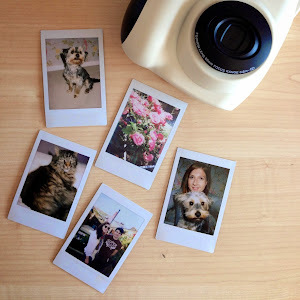 They’re really inexpensive – I got mine from Wilko when I first moved to London and they’ve lasted all this time. Moving onto the chest of drawers that, as I said, came with the room. 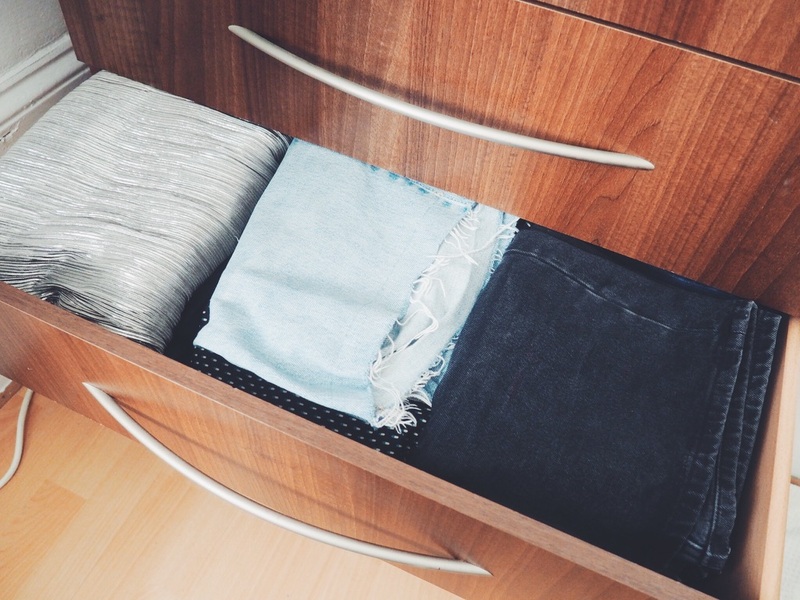 This is where I tend to keep items that I need to also get to easily – my skirts, some dungarees, shorts, other trousers and ‘at home slobby clothes’ all live in here as well as my underwear…but nobody needs to see that. 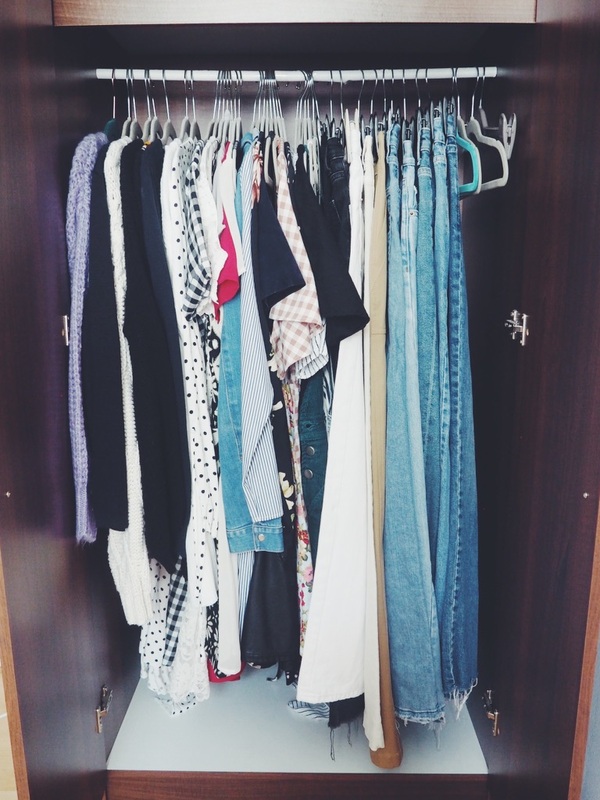 So onto my clothing rail! As you can see it is something that’s built into the shelving of my room – not sure if a previous tenant left it up there or if it’s already been there – either way, I’m so happy I have a rail! 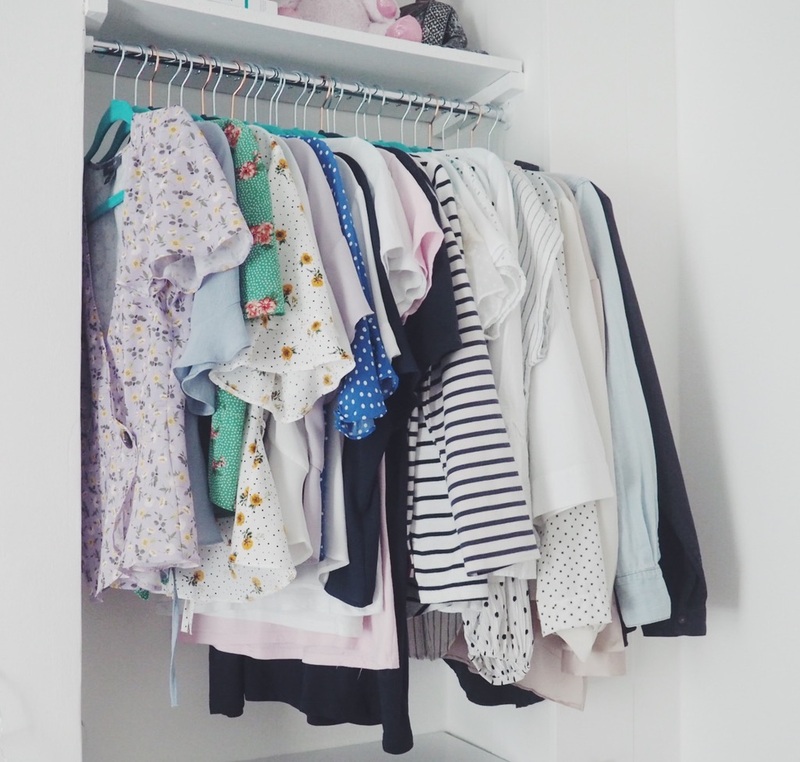 Whilst I’m great at getting rid of clothes when I know I don’t want or wear them anymore I do still have a lot to store and having this rail has been a Godsend! As you can see, I keep all my tops, shirts and blouses on here but I’ll change this in a couple of months to all my jumpers as it gets colder again. Even though it’s a super handy rail to have, it’s incredibly high up (even for 5ft 10 me) but luckily I have a little pouffe that I got from ASDA agessss ago and that gives me a little bit of extra height to easily grab what I need from the rail. But, where the heck do I keep the majority of my shoes and my many many coats? Well, I used to keep my coats in my wardrobe but it was just too jam packed in there so I decided to use my £19 worth of Nectar points in Argos to get myself a hanging rack and shoe rack. 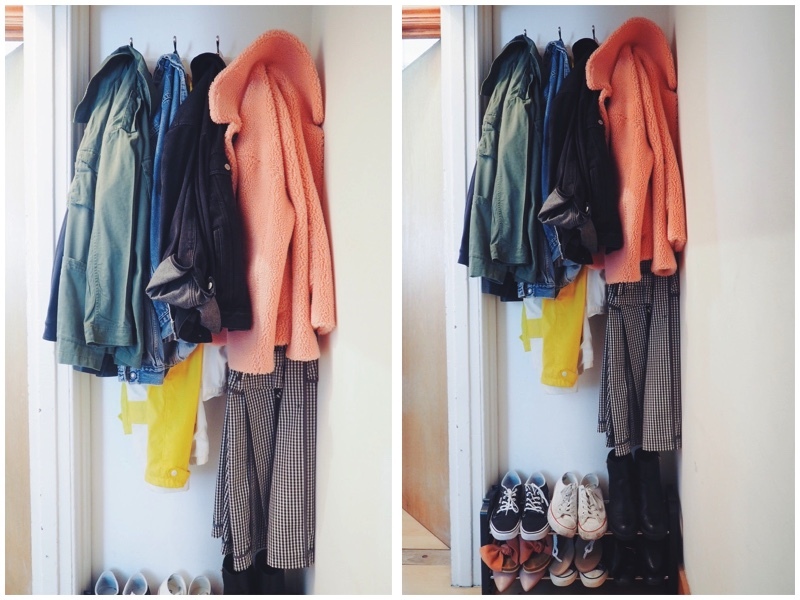 Between my flatmate and my room there’s a small corridor area with quite a bit of extra space so I thought that would be the perfect place for me to keep the majority of my coats! I was so chuffed with myself when I made this up – even my mum was surprised I did it all on my own – strong independent woman over here! And there you have it! 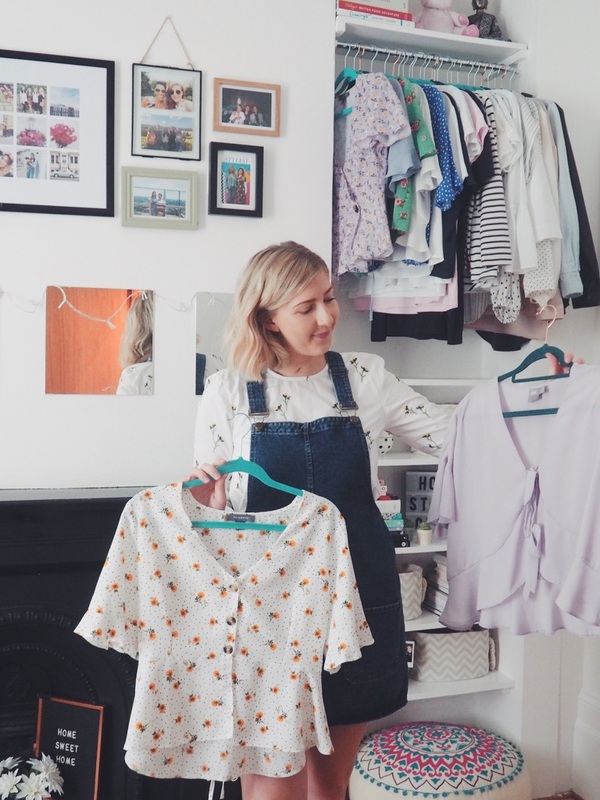 That’s how I store all my clothes in a house share – I hope this post has given you a bit of inspiration on how best to store all your bits and bobs, any questions? Just leave me a comment below! Full disclosure…my bag doesn’t always look like this! I mainly keep my bags pretty tidy though (apart from the odd post office ASOS return receipt or chocolate bar wrapper) as I change them around so much. 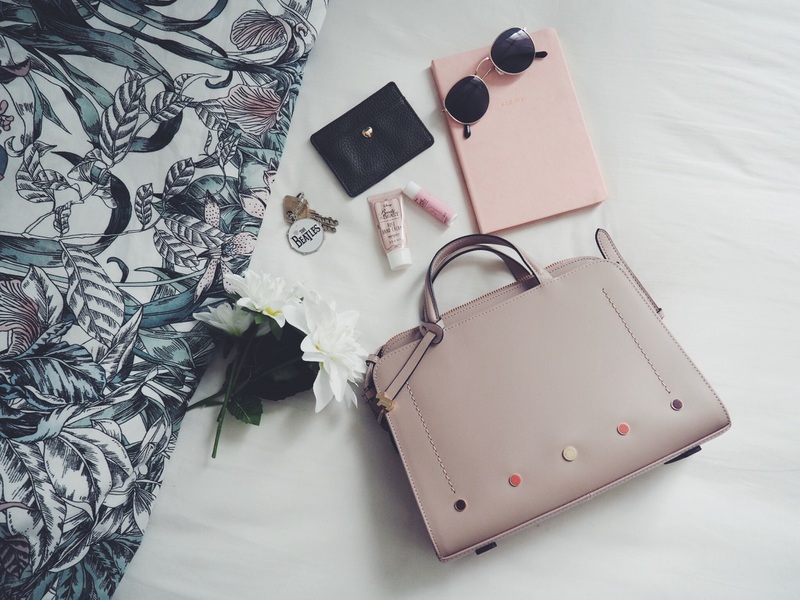 I have one bag - my beloved Kate Spade that my mum got me for my birthday last year - that I use every day as it’s the perfect size for work but, when I’m heading out for the day then I want to take a smaller bag. And, that’s where my second most-used (now) bag comes into play. I was kindly gifted this bag out of the blue from a lovely PR but was under no obligation to write a post. 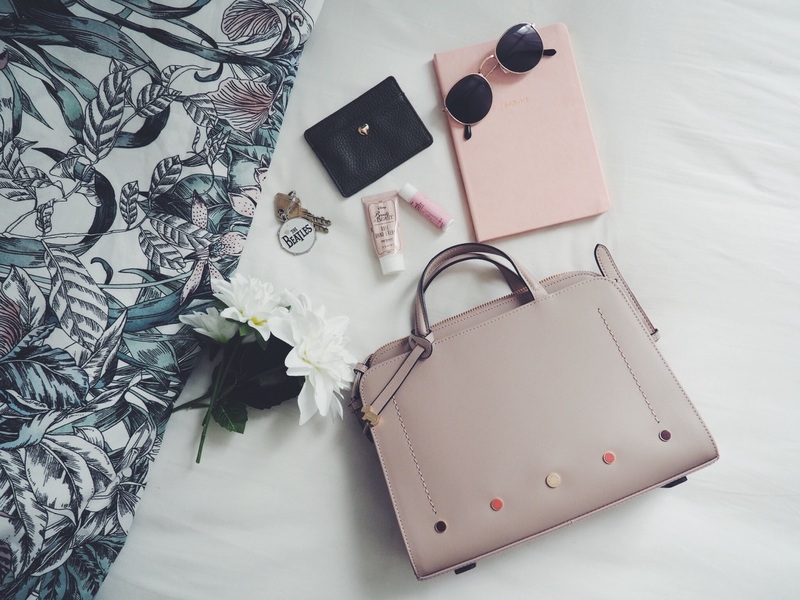 But, after I got such lovely feedback from my What’s in My Beach Bag post recently then I thought I may as well share with you what I thought of this one just in case you were thinking of investing in a Radley bag yourself. I was sent the bag way back in March so I’ve had enough time to fully try it over weekends and when I’m at home to see what I can carry around with me and what won’t quite fit. It’s a really good size for when you don’t need to take much out with you and is in a great taupe colour that you can wear with SO many other colours – it particularly looks great with white in the summer, though! 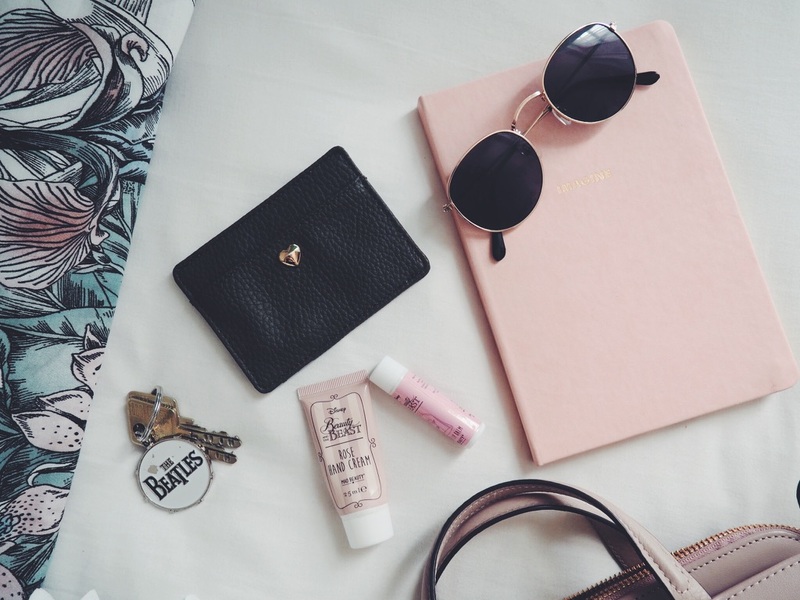 It’s made from smooth leather and has so many compartments including a zip compartment, two slip pockets AND an adjustable strap which I LOVE on a bag. Yeah, bags are my thing, can you tell? And, to top it all off it has the classic and iconic Radley dog charm that is also detachable and comes with a Radley dust bag. Normally when I take a small bag out I’ll not usually won't bother with a purse, I’ll just take my little card wallet instead that I picked up for a mere £2 from Primark. So many smaller bags rarely fit a purse (this one does, however, even my huge Kate Spade purse) and if I’m just going out for the day I’ll only take a couple of cards with me – it’s also easier when you’re using contactless and hopping on and off the tube and bus in London. Now that it’s sunny I can swap my winter gloves out with my summer sunglasses! Hurrah! And, Primark comes up trumps again with this pair for just £3 – they have some in store still and I would definitely recommend this shape! I also carry a little notepad around with me just in case inspiration should ever strike when I’m out and about (it so rarely does, but you never know!). So many people write to do lists and ideas into their phone now but I prefer good old-fashioned pen and paper, because apparently I’m 80 years old. The little bits and bobs I keep in my bags, I transfer out from one to the other as and when I use them (I have around 20-30 bags so things get moved around a lot). In this case I took my hand cream and lip balm that I got from my Christmas advent calendar (yeah, these things have lasted a long time) that my Mum got me. 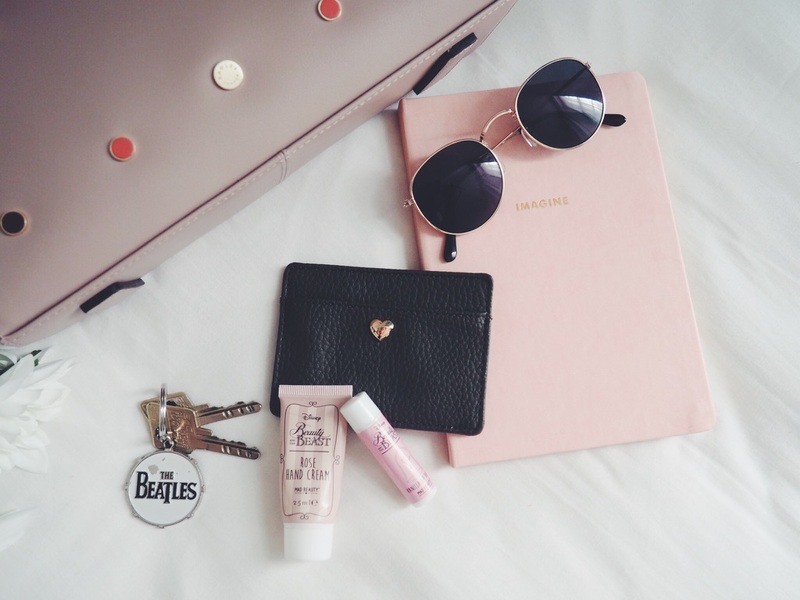 And then there’s just the absolute essential thing I’ll never leave the house without – my keys! I only have two keys as I only have two locks to my flat in London and a simple ‘Beatles’ key ring on there, mainly so I can find them a little easier! And there you have it! 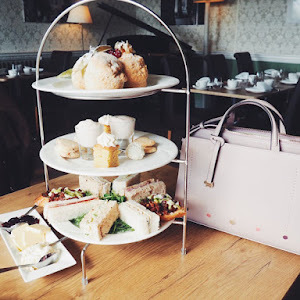 My What’s in my Radley bag post! 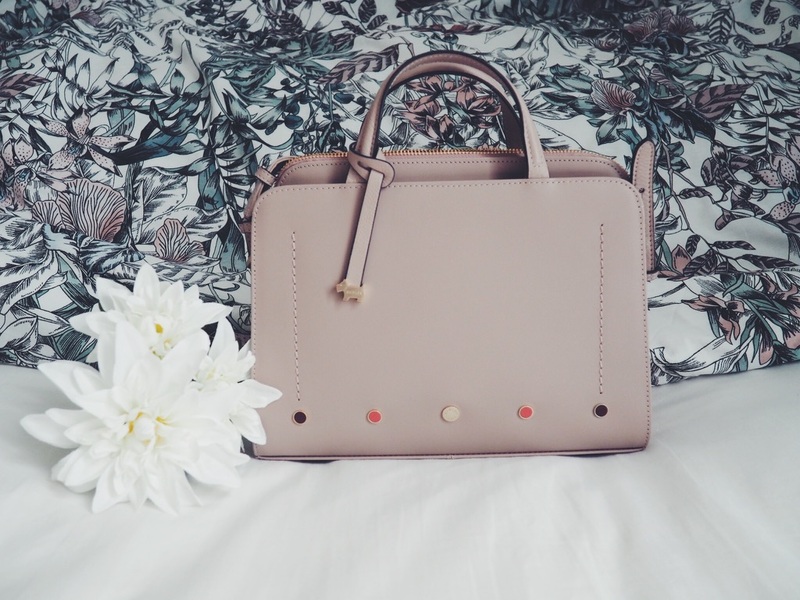 Even though this one was gifted to me I do tend to spend a bit more on my bags now as the quality is so much better and they last forever…like, literally forever! 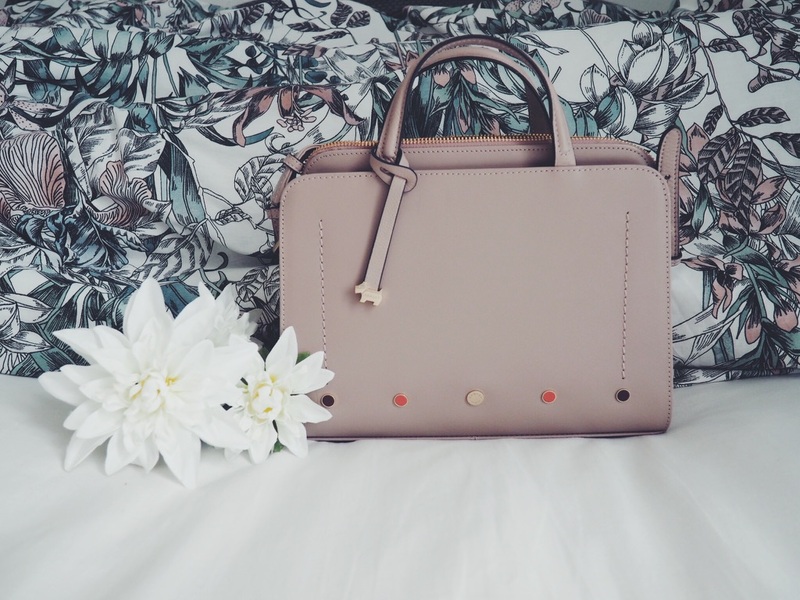 I would definitely recommend getting a Radley - they're SO well made and beautifully designed - not to mention the gift box it comes in is insanely pretty and makes it feel even more special. 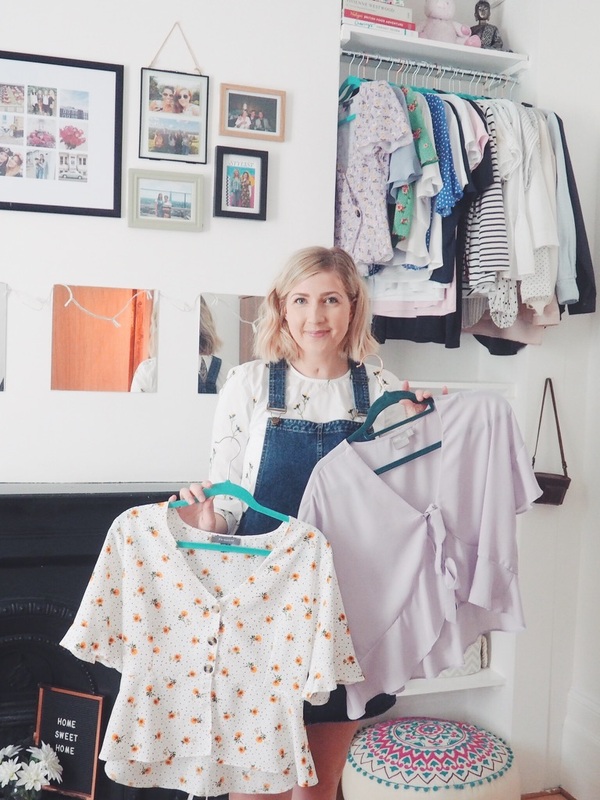 In today's post I'm coming at you guys from a room you may not have seen in a while, my bedroom at home home! Whilst I'm still working in London right now and I'm obviously still living there (could you imagine the daily commute from Somerset to London?! ), I am currently planning for the future and am starting to think about where I'll be and what I'll be doing in six months-a year's time. And, if I'm honest I can see myself living at home again with my mum, brother and Daisy dog so I can save for my own place in Bristol - even if that means I'm 30 and living at home, I don't care. It's somewhere I've always seen myself living and is like a little London (but nicer and with my favourite Primark store there - winning!). 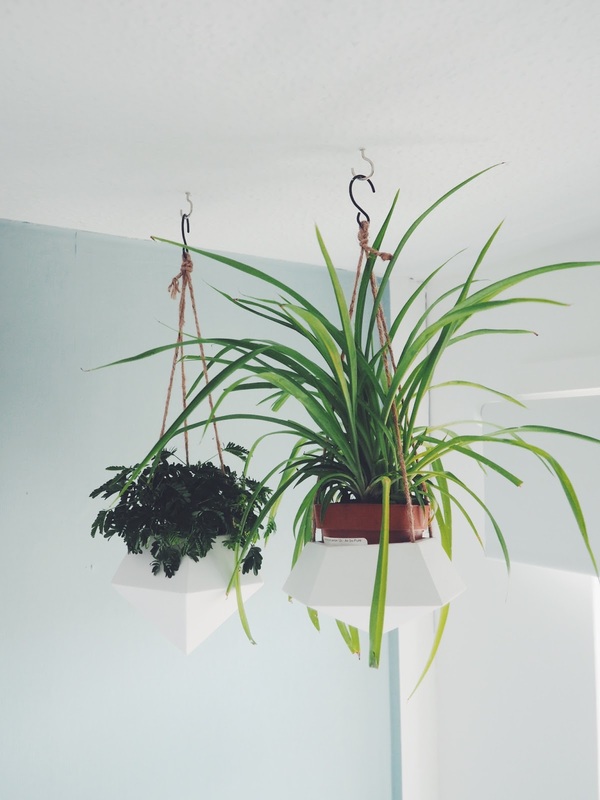 So, to prepare for the move, even though I am thinking a little in advance here, I wanted to redecorate my room with some new furniture and a fresh lick of paint and plants. But, my mum got there before me and actually decorated my room for me for my birthday this weekend just gone ... what an absolute hun! 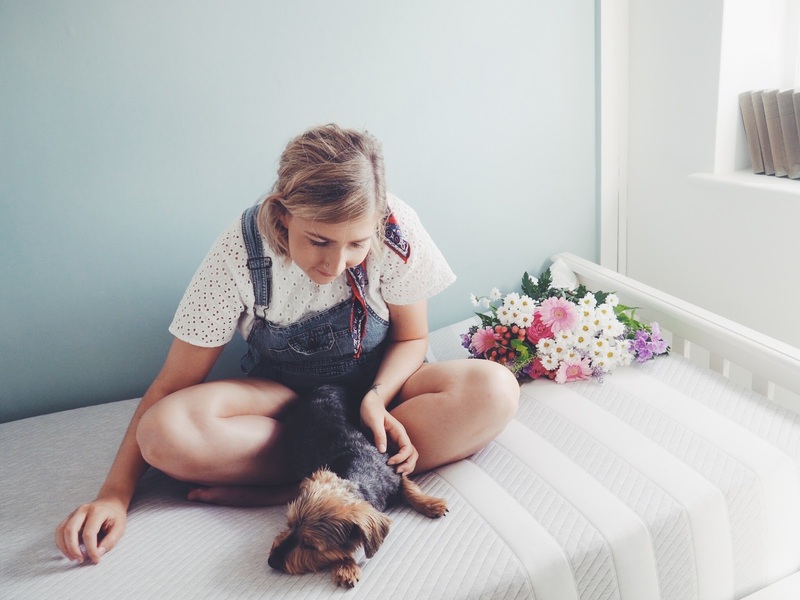 As you can see I've been left with the 'box room' of the house but I'm making the best of a small situation and even have mattress brand Leesa helping me out with this post by giving me a brand new mattress to help make it super comfortable and more homely! 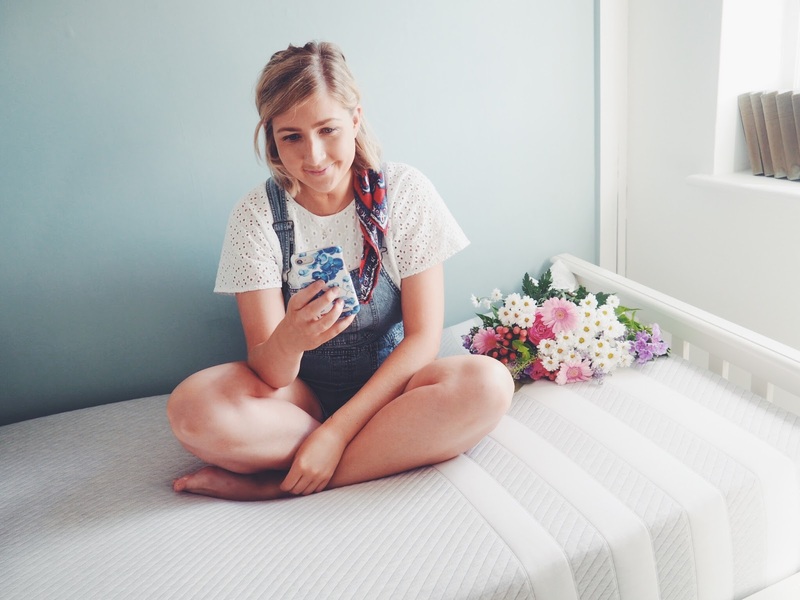 The mattress itself is made up of three lovely squidgy layers - 5cm of Avena foam (this allows air flow for a cooler night's sleep - um, NEEDED right now), 5cm of memory foam and 15cm of support foam. That's a whole lotta foam! The mattress comes delivered to you compressed and rolled in a box, you hardly even realise it's your new mattress...apart from the fact that it's super heavy... Once you've unrolled the mattress onto your bed, with the four iconic white stripes at the bottom of the bed, and left it for a good 24 hours so it can fully expand then it's time for your first night of blissful sleep! 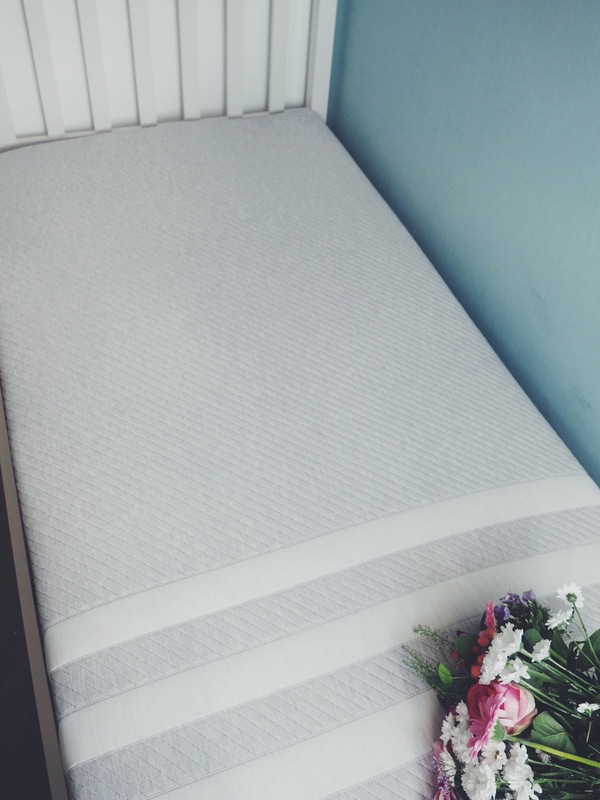 I didn't actually think I was a mattress snob until I slept on my Leesa. I've only ever had your sort of run-of-the-mill mattresses before along with a mattress topper but now I've got this one, there's no going back! 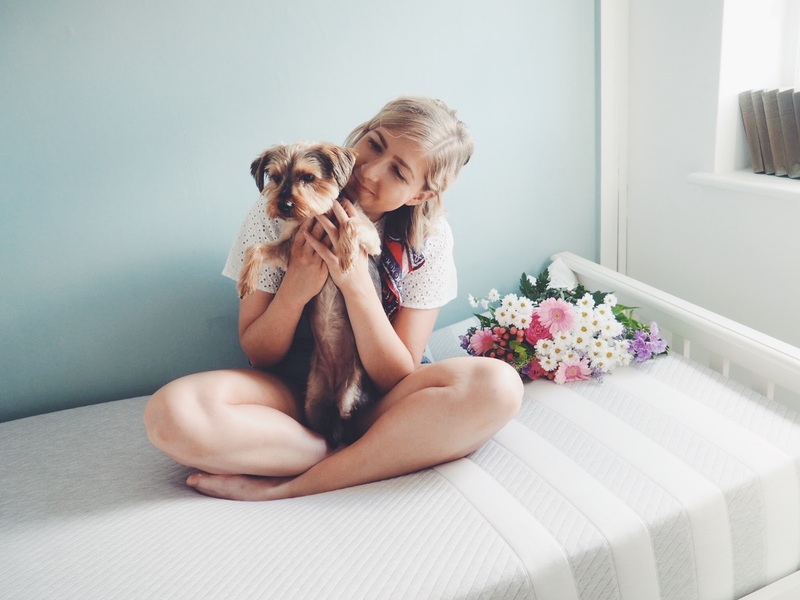 I did think with all that foam the mattress would envelope me but that's far from the truth - even as I'm typing this post out I'm perched on the mattress with Daisy dog snoozing by my side (she LOVES this mattress) and am not becoming engulfed into the material at all. It's sturdy when it needs to be but also oh-so dreamy to sleep on. I normally curl myself up when I sleep and this mattress is perfect for that as it moulds to your body whilst also giving you the freedom to wriggle - I'm a wriggler, for sure. I've noticed that my sleep is a lot deeper and I wake up less during the night, and I can definitely notice the difference in my sleep patterns when I go back to my regular mattress in London! 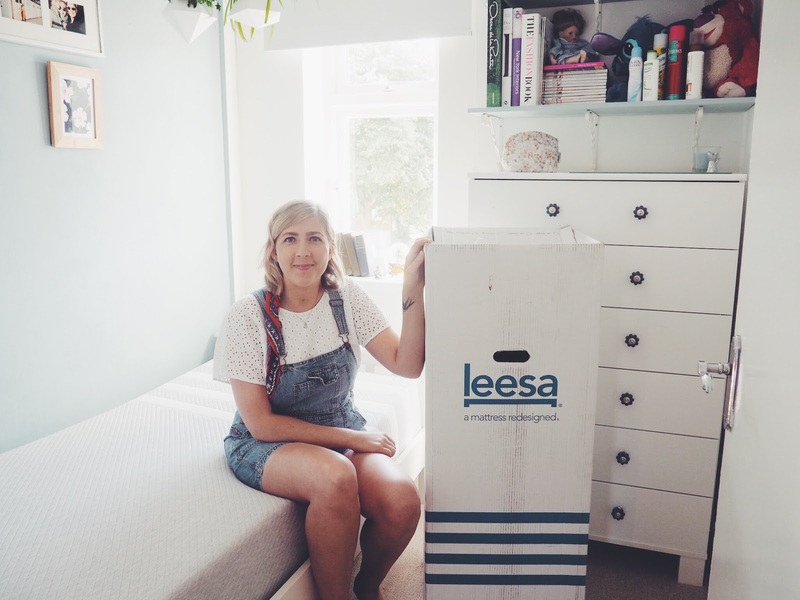 I've had the Leesa at home for a month and have been coming home at weekends a lot recently to try it out properly so I can have an honest opinion about it - my verdict? So far, so good. I do get back pain, mainly because of my top heavy body type so sinking into this sort of mattress that is firm but also incredibly relaxing has helped with that pain. I can say - Scout's honour - that I completely love this mattress and even my mum, who has always had a memory foam mattress, is jealous of just how comfy this one is! Fancy getting your very own Leesa? 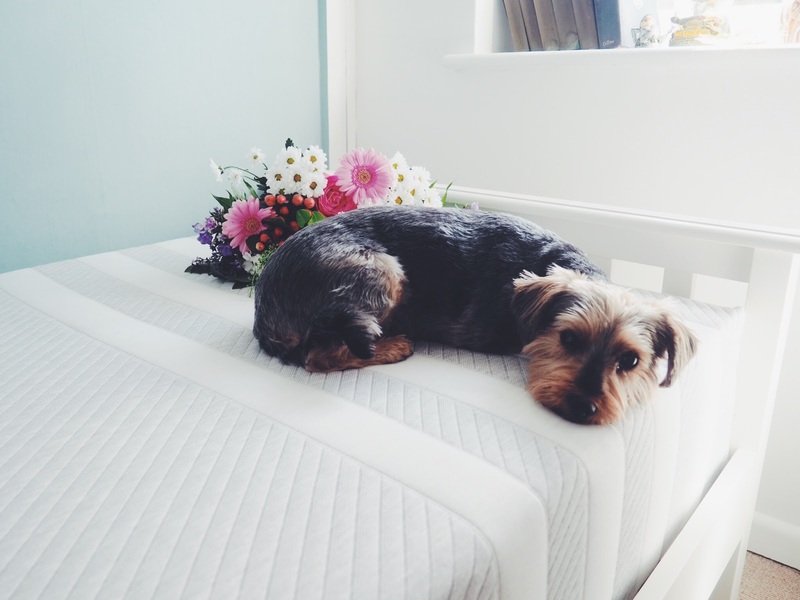 Head to their website and use code HALCYONVELVET for £100 off your new mattress. This post was in collaboration with Leesa but, as always, all opinions and thoughts are completely my own. To quote one of the greatest pop stars of our time…oops, I did it again! One Saturday a couple of week’s back, for the first time ever in my life, I fell out of bed. After dealing with the humiliation (even though I was by myself) of my 28-year-old self falling hard onto the wooden floor from my large double bed, I was then well and truly awake at a super early 6am! And when that happens what else is there to do than to seize the day? !...by going to Primark! I picked up just a few bits and bobs to tide me over in this hideously hot weather we’re having right now and even bought myself a couple of things ready for autumn because, I don’t know about you, but I just can’t wait to be cold again. Layering, hot chocolate, woollen bobble hats, thick black tights, comfy throws and all the sights and delights of London! Anyway, that’s not why you’re here is it? 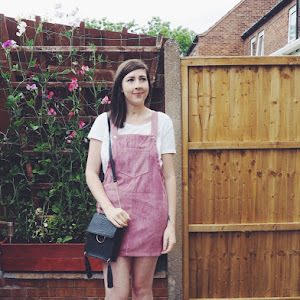 I seem to be living in this sort of thing at the moment – dungarees (both short and long) and pinafore dresses are fast becoming my uniform for work and the weekend! 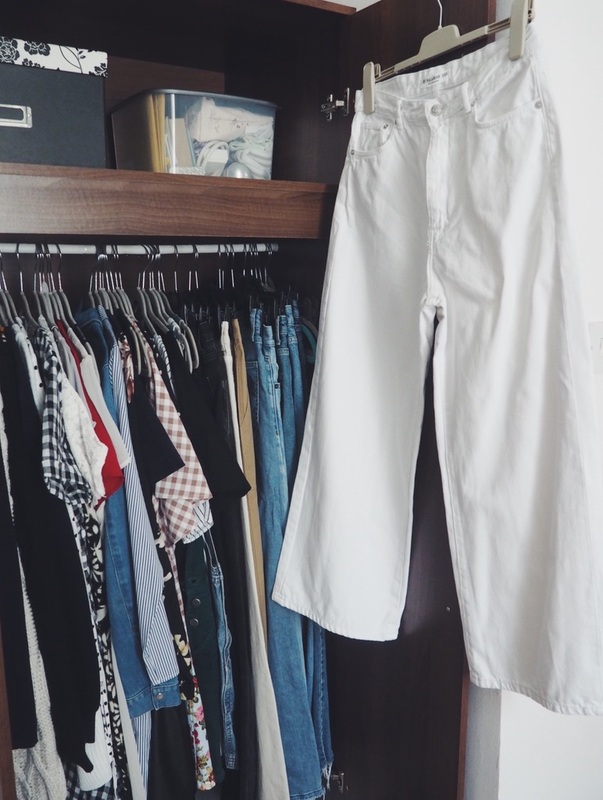 As it’s so hot out there right now all I want to do is wear loose fitting and lightweight clothing, considering this is denim it’s actually pretty thin so no sign of sweat when I’m wearing it - which is always a win, in my opinion. I like the dark wash blue denim colour and the pocket detailing on either side – love me a dress with pockets. I wanted this top so much that when I couldn’t find it in the Tottenham Court Road PrimarkI went all the way down the other end of Oxford Street and found it in the Oxford Circus store! All whilst London Pride was going on as well – commitment! But, I’m glad I found this pretty blouse as it’s the perfect piece to wear with jeans (I styled it up with my white ones over on my Instagram), sandals and a straw bag. Also, can we just take a moment to appreciate the colour?! I CANNOT GET ENOUGH OF THIS JACKET! Not only is the colour absolutely gorgeous, the buttons are a stand out detail and the arms a good length for tall gals like me, the fit is also absolutely perfect! It’s not a crop but it sits just on your hips which is super flattering if you wear it with high waisted jeans or a skirt. I’m excited to wear it to death in the autumn and can’t wait to style it up…just waiting for this little heatwave to be over tbh. Dainty floral blouses seem to be a thing for me at the moment. And, if it’s offering up a deep v neckline and button through detailing then I’m here for it! This one also has a tie at the waist that I normally just leave to the back of the top rather than bringing it round the front and tying it. 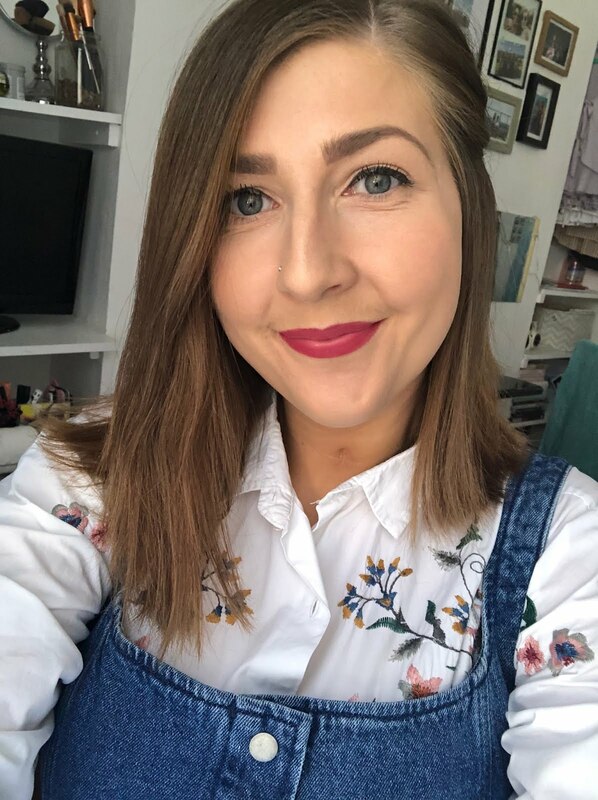 The print of this blouse is super cute and I love the little spotted detailing as well – I’ve been wearing this to death ever since I bought it and even got my friend to buy it as well! Yeah, so, I’m having a thing with lilac at the moment. I actually went into Primark again today and had to stop myself buying a lilac knitted jumper…but now I can’t stop thinking about it…so will probably go and get it when I’m next in, let’s be honest. This cardigan is actually something I’ve been after for quite a few years (I know right, how fussy am I?) but some cardigans really don’t suit me. But, this one is a babein’ piece to have hanging in your wardrobe and I particular love the comfy look of it. I know it’s going to keep me warm in the evenings! Ever heard the saying when you like something so much you buy it in every colour? Yup, that’s what I do. I love this top that’s similar in shape to the floral blouse I just spoke about but absolutely living for this pretty light blue colour! It has the button through detailing that is everywhere at the moment, the tie at the waist and gorge fluted sleeves that are oh-so-flattering. Psst, blue not your colour? It’s also comes in a vibrant mustard!